On June 26, 2014 at approximately 1:00pm Kali Smith walked into the Lealman Fire Department and informed the staff that he was had an arrest warrant, and wanted to surrender. Kali Smith was taken into custody by the Pinellas County Sheriff’s Office without incident. SMITH was wanted in connection to the June 16th, 2014 shooting in Pinellas Park. Following the arrest of Smith for the outstanding warrant, Pinellas Park Police charged him with Aggravated Battery with a Deadly Weapon. 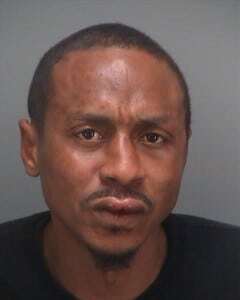 At this time, Smith remains in the Pinellas County Jail. His bond for the warrant (Failure to Appear for Battery) is set at $15,013 and the bond for the shooting has been set at $20,000. On June 16, 2014 at 11:28am officers from the Pinellas Park Police Department responded to a call of a person shot at a residence at 5815 89th Avenue N. Upon arrival, officers found 35 year-old Jerry Wright injured inside the residence suffering from a gunshot wound. An altercation took place between Wright and the now identified suspect 36 year-old Kali Lemar Smith. During that altercation, Smith produced a handgun and shot Wright. Wright suffered serious injuries and underwent surgery that same evening. Pinellas Park Police have now identified Smith as the suspect in this case. He has an active warrant for his arrest for an unrelated offense as well. Pinellas Park Police are asking anyone with information on the whereabouts of Smith to call their local police department. SMITH is to be considered armed and dangerous. Anyone with information that may help identify the suspect responsible for this crime should call Crime Stoppers at 1-800-873-TIPS (8477). Report anonymously online at crimestoppersofpinellas.org, text “TIP144 plus your tip” to 274637(CRIMES) or send a mobile tip using our new “TipSubmit Mobile” application, which is a free download for iPhones, iPads, and Android devices. (Text STOP to 274637 to cancel. Text HELP to 274637 for help. Msg & Data Rates May Apply.) If your anonymous tip leads to his arrest, you may be eligible for a cash reward of up to $1,000!